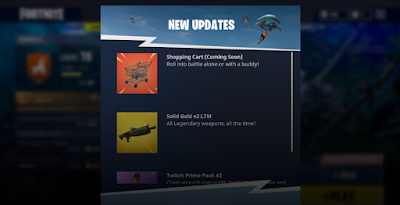 Fortnite Game News Feed Today shows that a Shopping Cart Vehicle is on the way . 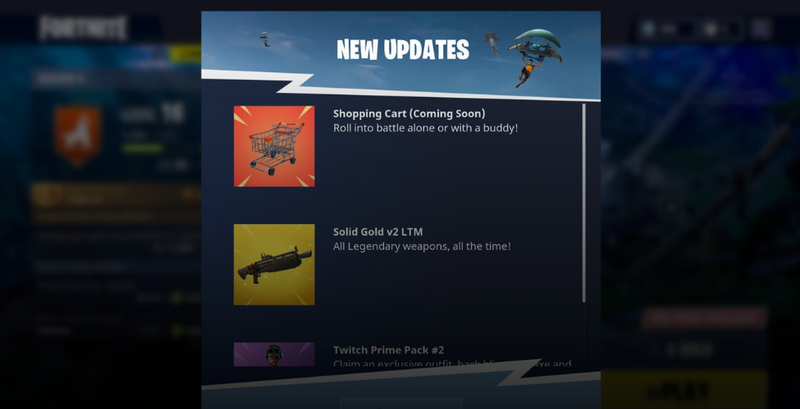 "Roll into battle alone or with a buddy''.The Cart will Work both is Solo and Squads .We don't Know yet if you will be able to drive the cart or if it has any special attributes to help you on the battlefield .At they very least ,it may give you the element of surprise ,as seeing a cart whizz by is not something Fortnite Players are used to . There is no word on when the Shopping Cart will be added to Fortnite , We will comes with More Details so Keep Connect with Us and Like Facebook Page . Fortnite newest cosmetic items --the Brite Bomber Outfit and the Rainbow Smash Pickaxe ,are available now From the in game store .The Brite Bomber Outfit costs 1200 V-Bucks ,while Rainbow Smash axe goes for 1500 V-Bucks.